I went to Kendall Toyota looking for a fully loaded 2007 Toyota Tundra crew max. Kendall Toyota did not have one and said it would have to be ordered. I was quoted $421 a month for a 36 month lease. They wrote on my order that I wanted a 4x4 with navigation system and 20 inch wheels so I settled in to wait for the truck to arrive. It was supposed to take from 1 to 4 weeks. 2 weeks later I received a call that the truck has arrived. I went to Kendall Toyota only to discover that they had ordered the wrong truck, specifically this one was not a crew max. Claiming a mix up with another order, Kendall Toyota said it would be 10 more days. After 15 days I call Kendall Toyota but am told my truck has not yet arrived. They provide me with a loan car, and after having the loaner for about 4 days I get a call that the truck has arrived. When I go pick up the truck I discover that it did not have the rims I ordered. The Kendall Toyota sales manager said there must be some mistake and looks on his computer and said he forgot to order the vehicle with the rims and that it would be an additional $50 dollars a month for the rims if I wanted them. I reminded him I had the order in writing and that the rims were included. The Kendall Toyota sales manager said he couldn't do it with the rims unless I signed a new contract for more money. I contacted Toyota to complain and all they did was have the dealer contact me and give me a different excuse for not honoring our signed agreement, something to the effect that the price went up because the lease price had changed and was not due to the rims. 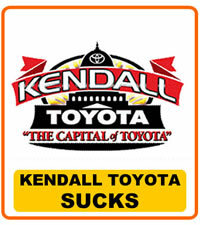 You'd be better off buying from anywhere else than Kendall Toyota of Miami, Florida.